Add or remove users to assist in a existing PA Assist setup. You can change the User's being assisted or the Assistant within an existing PA Assist. Within the Admin section navigate to PA Assist. 2. Click Edit found at the end of the PA Assist setup you would like to change. Click on the current Assistant name. 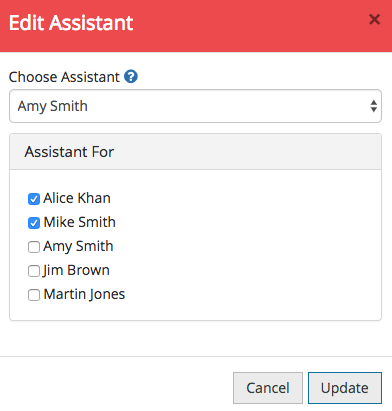 Select a new User from the drop-down list to become the Assistant. Remove a user by clicking their name to remove the tick. Add a user by finding them in the Assistant For list and clicking their name to add the tick. 3. Click Update once you have made your required changes. You can change a PA Assist setup as little or as often as you like.